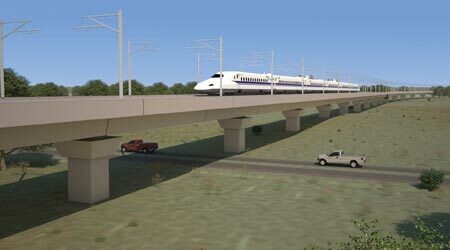 A computer rendering of the Texas Central bullet train, which will operate on dedicated, elevated track. At a ceremony held last month at Houston’s City Hall, Mayor Sylvester Turner could hardly contain his enthusiasm about a proposed 240-mile bullet train between the city and North Texas. Joining Turner at the event were representatives of Texas Central Partners LLC, the private company that plans to build a high-speed rail system based on Japan’s Shinkansen N700 technology to transport passengers from Houston to North Texas in about 90 minutes. 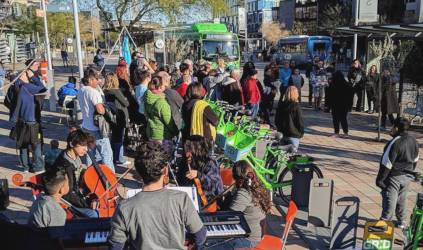 The Aug. 17 ceremony was organized to sign a joint agreement in which the city pledged its support for the project, which is estimated to cost between $10 billion and $15 billion. Under the memorandum of understanding (MOU), Texas Central pledged to work with Houston officials on economic development, jobs creation and traveler-friendly connections between the future train station and the greater Houston region. Although the site of the Houston station has yet to be determined, Texas Central officials have said it will be built in the general area south of U.S. Highway 290, west of Loop 610 and north of Interstate 10, near downtown and major employment centers. 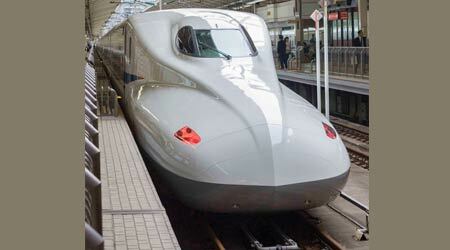 The agreement is the strongest sign yet of local support for the bullet train. The project is expected to generate $36 billion in direct economic activity over the next 25 years and create more than 10,000 jobs during construction, as well as up to 1,000 once the train is operational, Texas Central officials say. Many of those jobs will involve construction within Houston, including the rail line and the station, according to the MOU. Moreover, as one of the largest civil infrastructure projects in U.S. history, the rail-building effort will attract suppliers and workers from throughout the state, according to Texas Central. The bullet train would help curtail traffic congestion in Houston and North Texas, the fourth and fifth largest metropolitan areas in the nation, Turner noted. The MOU was the second major announcement by the developer last month. Revealed just three days earlier was news that Fluor Enterprises and The Lane Construction Corp. will be the project’s preferred designer and builder. Although financial details were not publicly disclosed, the agreement calls for Fluor and Lane to refine and update construction planning, scheduling, cost estimates, procurement and design and engineering activity related to civil infrastructure. After that phase of the project closes, the two firms would become the preferred design-builder. Texas Central is working with Central Japan Railway Co. to develop the bullet train based on Shinkansen N700-I system technology. Fluor Enterprises is a subsidiary of Fluor Corp.; Lane is a subsidiary of Salini Impregilo. Both companies are based in Irving, Texas. The firms were chosen in part because of their ties to other highway and mass transit projects in the state, according to Texas Central. The project still is far from being a sure thing: It has yet to receive Federal Railroad Administration (FRA) approval, and final private funding has yet to be secured. However, both August announcements marked milestones in the investor-owned railroad company’s three-year endeavor to introduce a privately financed and operated high-speed rail line — with trains that will run at speeds of 200 mph — in Texas. Nothing like it in the U.S. 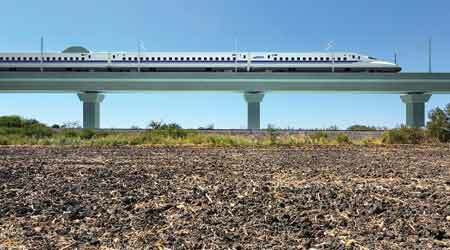 It also would be a first in the United States because of the train’s technology and safety record: Texas Central has been working with Central Japan Railway Co.’s (JRC) N700-I bullet train and its Shinkansen system, which has a 52-year safety record of zero fatalities associated with train operations. JRC has opened a subsidiary office in Dallas to focus on the project. Another safety advantage for the Texas train is that it will be a double-track system dedicated only to the high-speed train; it will not share track with freight or other passenger trains. Because most of the system will be elevated on concrete viaducts, it will not intersect with roads or highways. Texas Central’s founders chose the Dallas/Fort Worth-to-Houston region as the most feasible for the first U.S. bullet train after studying 96 other city pairs. Among the reasons for their choice: More than 14 million people travel between Houston and North Texas each year, and the only options are by road or air. Road travel takes several hours due to severe traffic congestion, which has increased by 10 percent per year just since 2012. Also, Interstate 45 between Dallas and Houston is the second-deadliest stretch of highway in the country, Texas Central officials say. The train’s route would be located in what’s known as the “utility corridor,” which — according to the project’s environmental documents filed with the FRA — follows existing electrical infrastructure easements between Dallas and Houston. The area is relatively flat, straight and has soil conditions that would support the rail infrastructure. A more specific route with a preferred alternative will be identified after the FRA completes the draft environmental impact statement later this year, says Holly Reed, Texas Central’s managing director of external affairs. Although exact locations are still being worked out, Texas Central will develop three stations along the route — one each in North Texas, Houston and the Brazos Valley. All three will be surrounded by retail establishments, restaurants, parks, light rail and other real estate development, which will further add to job growth, Texas Central officials have said while promoting the project to communities in the corridor. To garner public support across the 10 counties through which the train would travel, Reed and other company representatives have been regularly hosting informational gatherings with public- and private-sector organizations, and meeting with local officials to explain how the project will benefit their cities, towns and counties. 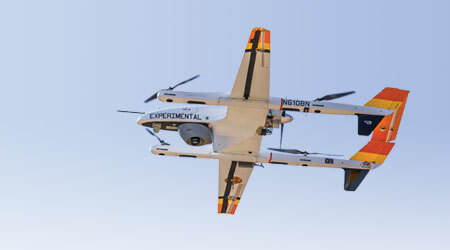 Reed often answers questions on issues such as where the project stands in its FRA regulatory review, how the Shinkansen rail technology works, why the North Texas-to-Houston region was chosen for the project, how the company intends to acquire the necessary land and how the project will be paid for. On that latter point, Texas Central has insisted from the start that the train’s construction and operation will be covered by private funds and not require federal grants or state appropriations. The company might consider seeking loans from existing federal sources — such as the Transportation Infrastructure Finance and Innovation Act and Railroad Rehabilitation and Improvement Financing programs — which are open to the private sector. If pursued, such loans would be repaid with interest over time and guaranteed by ticket sales revenue, Texas Central officials say. And, as a private for-profit company, Texas Central will pay property taxes, and state and local sales taxes, Reed says. The fact that the bullet train will be a big, bold, private-sector initiative and not a government project is something that many Texans would appreciate, Reed believes. The elevated tracks would not intersect with local roadways, which adds a safety element to the rail service. As for acquiring land access, Texas Central representatives have been meeting individually with landowners to address their concerns and discuss the company’s land option program. Since a majority of the 240 miles of track will be elevated, landowners’ access to their property in most cases will be preserved along the route, Reed says. Where tracks will not be built on elevated viaducts, they will run on elevated berms. From an implementation perspective, the four- to five-year project will be massive and have a direct impact on the region’s economy, says Reed. For example, the amount of concrete needed to build the infrastructure will be three times what was needed to construct Hoover Dam. And if placed end to end, the amount of steel involved would stretch from Houston to Phoenix. Although Texas Central execs have tried to make a case for the bullet train’s benefits to the region’s economy, the project is not without its resistors and critics. In February, the company dropped more than a dozen lawsuits against landowners who declined to allow access to their property for surveying. Texas Central execs said at the time that dropping the litigation would allow the firm to negotiate land deals more quickly, according to local news reports. Also, Texans Against High Speed Rail Inc. was formed in 2015 as a statewide effort to stop high-speed rail projects in the state, including the bullet train. The group aims to protect landowners’ rights and has questioned whether Texas Central can, as a private company, use eminent domain authority to obtain land access. Texas Central officials argue that private domain powers are allowed for railroads under state statutes. Additionally, Texas Central has faced state lawmakers who are opposed to the project. In the last regular legislative session, which ended in May, several bills were introduced in an effort to stop or hinder the project. Two of those bills passed, but neither will thwart the project, according to Reed. “We went into the legislative session knowing we needed to work with a lot of partners across the state and show the support the project has,” she says. And that support is growing every day, adds Reed, who left a longtime career at AT&T to help educate and inform Texans about the bullet train. Sometimes the people she gives presentations to have never ridden a train, let alone a high-speed one. But Texas Central executives are quick to respond to such speculation with caution.